I have been offered by the publisher to read and review this book. I was enthousiast as network programming is really something I like and I have heard about Boost.Asio usage in some projects without really having taken the opportunity to check out myself what Boost.Asio really was. The outcome of having read it is that I was left with a lot more unanswered questions than I have received answers. It is a very short book probably of the style 'hands on' 'direct to the point' type of book which I guess has merits so someone can start reading it and hack something very fast. However, in my opinion, this is overdone making the book a bad choice for learning network programming. My first unanswered question I had when I picked up the book is Why should I use Boost.Asio and what are its benefits over other existing frameworks? 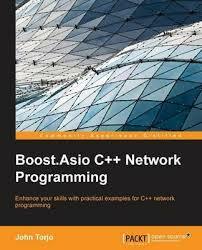 Of course, I know the answer that you can find also in the excellent book Network programming in C++ plus the fact that Boost.Asio is fully integrated with STL but the explanation is totally missing from the book. which are three different ways of performing IO. I am guessing that what is really done with Boost.Asio is non blocking IO which is close to real async IO and much more common place but nowhere in the book we take the time to really explain what Boost.Asio is really doing. Code examples are ok I guess so the author can make his point but I spotted a couple less than perfect code which I think is hurting the book credibility. I know this is a harsh judgement but for a book that aims to teach people how to program you have to be examplar as what you teach will be replicated by your readers. I am expecting perfection from a book examples. The type of code that you stare at for some time without being able to figure out how you could improve it. That is the type of quality that you'll get from a book written by Stroustrup or Stevens. 1. It is inefficient to call twice std::find(). Imagine that '\n' is the last character in a 2GB array! 2. comparing iterators with the operator '<' works because in this case the container happens to be a POD array but IMO this is bad style to use STL algorithm in a way that will not works on all containers (ie std::list) when using the more common operator != would achieve the same result. This works but polling sockets like crazy and sucking 100% of the processor is not the way to write a server that use synchronous mode. I understand that the book did not aim to be a network programming bible like a Stevens but I would have liked some network theory background. Things such as the different possible server topologies and their benefits drawbacks of each. A very small TCP primer. How TCP connections are established from a client? from a server? I know all that but I tried to have some empathy for the young reader who haven't been exposed to this basic knowledge and since these basics are totally absent from the book, it will be even harder for him to make sense out of the book. This is the first edition so hopefully it will eventually improved. To conclude, the book has some problems but if you can get a cheap copy it might serve as a very fast introduction to Boost.Asio and get you exposed to the API.